Today we crossed the equator and thus another reason to celebrate. King Neptune or Poseidon in Greek mythology is believed to oversee the equator. In order that we might secure safe passage for the ship over the equator we had a special ceremony. Making an appearance was the cruise director, Bruce, as King Neptune and the cruise hostess, Adele, as a mermaid. They officiated a ceremony where crewmembers from different departments were brought before a panel of the captain and his officers for judgment for a variety of fictional crimes. Each set of crewmembers was then covered in slime and thrown in the swimming pool. The Amsterdam orchestra was dressed as pirates and Equator Sling drinks were served and everyone had a fun time. Aileen Bridgewater lectured on her interviews with Mother Teresa in Calcutta, Sylvester Stallone and Princess Diana. She seems to always be at the right place at the right time to get the interviews. In the afternoon we went to the Wajang Theater to see the movie “The Five-Year Engagement” with Emily Blunt, Jason Segel and Chris Pratt. Dinner was another formal affair followed by the King Neptune Under the Sea Ball in the Queen’s Lounge. We had dinner with friends Peter, Peter and Brian from Toronto, Canada, at their table in the dining room. Wild and crazy recently retired guys! They boarded the ship in Sydney and will be disembarking in Hong Kong. The dining room was beautifully and colorfully decorated with all things under the sea. Brightly colored Mylar streamers with colorful fish attached were hanging everywhere. Mylar helium balloons of fish, turtles, lobster and octopus floated above every table. The waiters were all wearing white shirts with light blue vests and bow ties plus hats of brightly colored fish. After dinner there was a Gala Ball in the Queen’s Lounge, which was also decorated extensively with all things related to the sea. The orchestra played dance music and the ships uniformed officers were on hand to dance with the passengers. 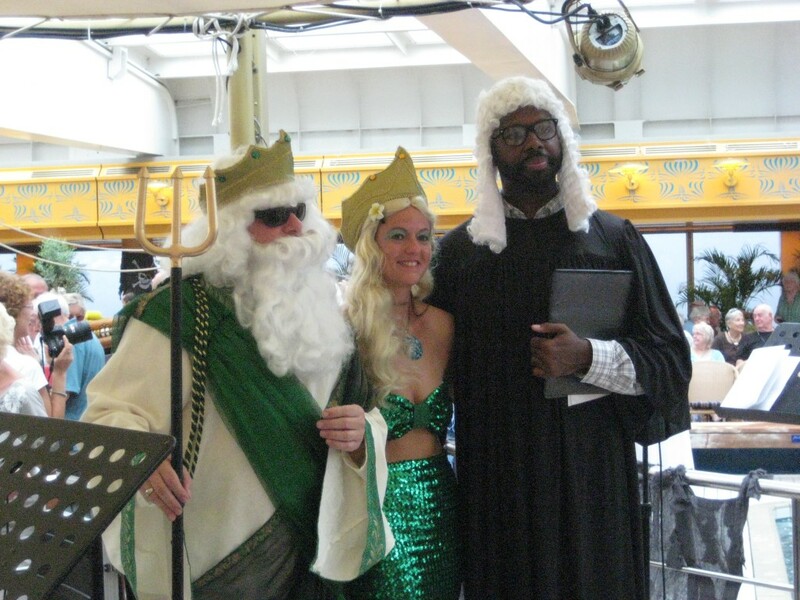 The cruise director and the hostess were seated on thrones, up on the stage dresses as King Neptune and a mermaid.